Dhow is the generic name of a number of traditional sailing vessels with one or more masts with lateen sails used in the Red Sea and Indian Ocean region. 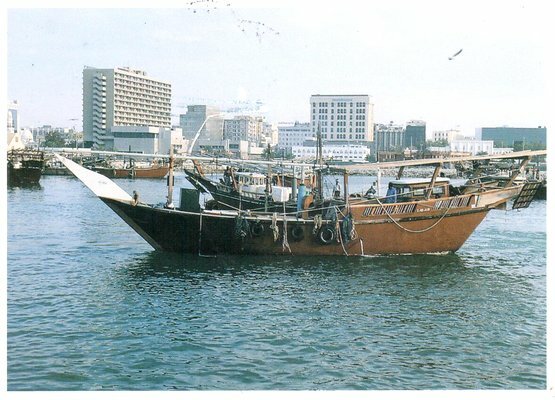 Historians are divided as to whether the dhow was invented by Arabsor Indians. Typically sporting long thin hulls, dhows are trading vessels primarily used to carry heavy items, like fruit, fresh water or merchandise, along the coasts of the Arabian Peninsula, Pakistan, India, Bangladesh and East Africa. 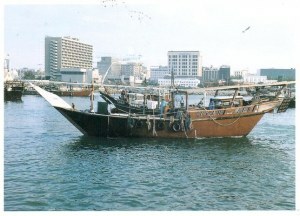 Larger dhows have crews of approximately thirty, smaller ones typically around twelve.